Though native to South America, pineapples (scientific name: Ananas comosus) made their way to the Caribbean island of Guadeloupe, and it was here that Christopher Columbus first spotted their spiky crowns in 1493. Columbus and his crew took pineapples back to Spain, where everyone loved how sweet this new, exotic fruit tasted. They tried to grow them there, but because pineapples need a tropical climate to grow, Europeans didn’t get very far. The only pineapples they could get their hands on had to be imported from across the Atlantic Ocean, a time-consuming trek that often resulted in bruised, rotten fruit. 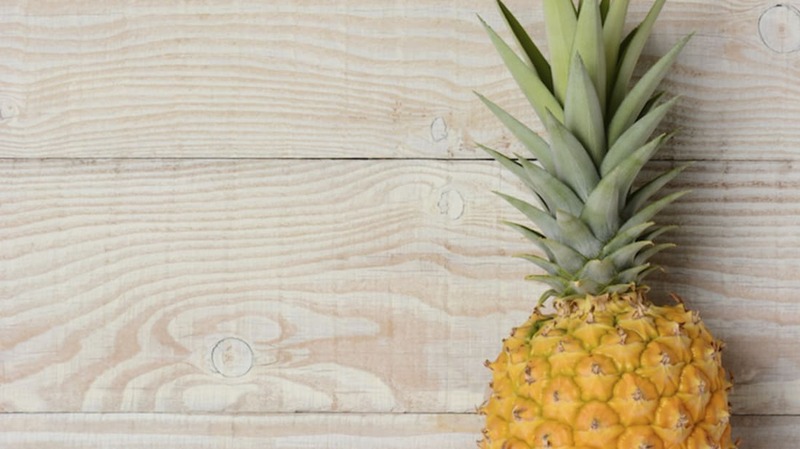 Later, in the mid 17th century, pineapples were grown in a few hothouses in England and the Netherlands, in conditions that mimicked the warm temperature and humidity levels needed to produce the fruit. Because they were in high demand and low in supply, only the extremely wealthy could afford pineapples. Monarchs such as Louis XV, Catherine the Great, and Charles II (who even commissioned a painting of his gardener presenting him with a pineapple) enjoyed eating the sweet fruit, and pineapples came to symbolize luxury and opulence. In the American colonies in the 1700s, pineapples were no less revered. Imported from the Caribbean islands, pineapples that arrived in America were very expensive—one pineapple could cost as much as $8000 (in today’s dollars). This high cost was due to the perishability, novelty, exoticism, and scarcity of the fruit. Affluent colonists would throw dinner parties and display a pineapple as the centerpiece, a symbol of their wealth, hospitality, and status, instantly recognizable by a party’s guests. Pineapples, however, were mainly used for decoration at this time, and only eaten once they started going rotten. To underscore just how lavish and extravagant pineapples were, consider the pineapple rental market. The fruit evoked such jealousy among the poor pineapple-less plebs that people could, if they wished, pay to rent a pineapple for the night. Before selling them for consumption, pineapple merchants rented pineapples to people who couldn’t afford to purchase them. Those who rented would take the pineapple to parties, not to give as a gift to the host, but to carry around and show off their apparent ability to afford such an expensive fruit! Throughout the 1700s and 1800s, artists depicted pineapples to symbolize hospitality and generosity. Napkins, tablecloths, wallpaper, and even bedposts were decorated with drawings and carvings of pineapples in order to make guests feel welcome. If people couldn’t afford to buy or rent the real fruit, they bought porcelain dishes and teapots in the shape of a pineapple, which became hugely popular starting in the 1760s. But fast-forward to 1900, when industrialist James Dole started a pineapple plantation in Hawaii, hoping to sell and distribute the fruit with his business, the Hawaiian Pineapple Company, which would later become the Dole Food Company. He was hugely successful—for seven decades, his Lana'i plantation produced more than 75 percent of the world's pineapples—and the company is still going strong. Love for the fruit hasn't waned (they are still a popular decorating motif), and Dole helped contribute to the pineapple’s evolution from overpriced, luxe commodity to accessible treat for the masses.